What a cool gift for the musical chef in your life! 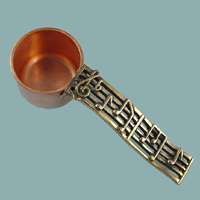 This beautiful hand made copper and brass (tablespoon) measuring scoop with its musical staff handle is handmade with love. Soooo sweet. Cute for serving or use as a coffee scoop. It measures a true tablespoon for cooking.